Based on the classic 1980s movie, The Goonies is a feature-packed 5 reel, 20 payline slot game from Blueprint Gaming. It comes with 6 different modifier extras that can strike at random on any spin as well as 6 more bonus features. Play on all devices from between 20p and £100 per spin. 18+. New players only. Min. deposit £10. Account balance is withdrawable at any time. Upon withdrawal, any remaining bonus spins are forfeited. 7 days to activate the spins. Bonus spins expire 24 hours after activation.<br> Play responsibly. Bonus – New players. Min. deposit £10. Wager req 20x. Bonus balance is paid with 10% instalments to account balance. Bonus balance is not playable. Max bet is £20. Account balance is withdrawable at any time. Upon withdrawal, any remaining bonus balance is forfeited. Play responsibly, begambleaware.org. The design in The Goonies is as high spec as you’d expect. The action takes place against the backdrop of a treasure map. On the reels you’ll see A to J playing cards plus weighing scales, skeletons, pirate ships and treasure chests full of gold. The top paying standard symbol is the super stacked skull and cross bones flag which pays 50 times your stake if you land 5 on a payline. Those same payouts are on offer from the silver coin which is the wild. It replaces everything apart from the bonus. Truffle Shuffle Wilds feature - extra wilds are overlaid over symbols to create a new combination. Mikey's Hidden Riches feature - a stack of wilds can be added to any reel. Data's Colossal Symbols feature - 3 adjacent symbols can sync and turn into a giant Colossal Reel. Mouth's Lucky Coins feature - any gold coin symbols that hit all turn into the same matching mystery symbol and a new payout calculation is made. One-Eyed Willy's Bonus Boost feature - extra Bonus symbols are added to the reels to enhance your chances of triggering the feature round. Sloth's Win Spin feature - a big win spin is guaranteed to hit. Following a losing spin, you could see a scythe swish across the reels and turn them into a win. A cave collapse can also turn a loser into a winner. Fratelli Hideout Bonus feature - pick from the keys shown. Behind them are a cash add which awards an instant bonus, a collect which ends the round or a hidden tunnel which gives the opportunity to land 1 of the other 5 bonus features. Skeleton Organ Bonus feature - more keys are in play in this round too. This time pick to reveal icons which in turn will match up to a total bet multiplier. An upgrade icon boosts the total bet multipliers or the possible feature that can be won during the bonus. Collecting 3 Key symbols unlocks the door to an additional feature bonus. Keep on picking until you lose 3 lives. Super Sloth Free Spins feature - these are played on a new set of reels dominated by the Fratelli family. If a Super Sloth Wild lands in view, any Fratelli symbols on the reels are turned into the top symbol. Following the final spin, pick a chest reveal to reveal a Super Sloth (which awards extra free spins), a Collect (which ends the feature) or One-Eyed Willy's Treasure Bonus (which awards the feature). Goonies Go Wild Free Spins feature - on each free spin (after the first one), 1 of the top reel symbols will turn wild. Once again, there’s a pick me element at the end of the free spins where you could win extra free spins with all the Goonies symbols wild or a trigger of One-Eyed Willy's Treasure. Inferno Free Spins feature - Inferno moves right to left across the reels on each free spin turning between 1 and 3 consecutive reels Wild. Spin the wheel for a collect, more free spins or One-Eyed Willy's Treasure feature. One-Eyed Willy's Treasure Bonus feature - you can trigger this directly by landing 5 bonus symbols or via the other bonus rounds. Spin One-Eyed Willy’s Wheel. Multipliers are applied to your total stake each time it stops. Keep on spinning until the booby trap arrives which brings the round to a close. If you don’t like the bonus feature you’ve been awarded from the original spin of the wheel, you can gamble and try and land a potentially more lucrative one. 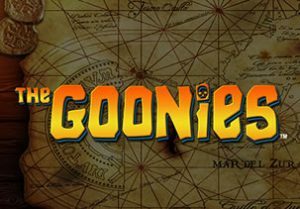 The Goonies is typical of Blueprint Gaming’s high-profile branded slot games. The design is very high end and features many of the main characters from the film. There’s a huge variety of extras on offer too, both from the modifiers and the bonus rounds. You certainly shouldn’t get bored here. As far as variance goes, we’re in the medium range with top payouts of 500 times your stake on every spin. The film version of The Goonies has gained cult status. This slot game benefits from a combination of classy sound and visuals as well as a wealth of extras to make this a very playable adaptation. If you like film-inspired slot games, From Dusk Till Dawn from Novomatic is recommended.